Racing has become a lot safer over the years and while accidents do happen, the drivers usually walk away with minor injuries or are taken to the hospital and end up with injuries that are none life threatening. There are however times when it seems that racing is not as safe as it actually is and 2015 seems to be such time. Not long ago Jules Bianchi died after his crash in Formula 1 and during a Superbike race at Laguna Seca both Bernat Martinez and Daniel Rivas Fernandez died after a crash with multiple drivers. Today Justin Wilson died after a freak accident during the Indycar race at Pocono Raceway where he got hit by debris (nose cone) coming of another car that crashed into the wall. Because he had nothing to do with the crash and he had no blame what so ever, this might be more difficult to accept then when a driver crashes after a mistake he made. Justin Wilson drove for Minardi and Jaguar Racing in the Formula 1 and after a few years he moved to the Champ Car / IndyCar in the USA where he raced many years. 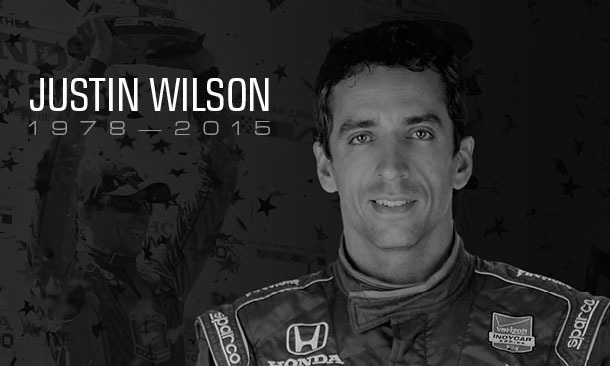 Justin Wilson had a wife and 2 daughters age 7 and 5. This accident will no doubt spark another discussion on racing safety and the need for a closed race car. I think this is not the way to go, mainly because the danger that comes with racing is part of why people watch it and why drivers race. Sure we all feel bad when something like this happens, but all drivers know the risks and are willing to take them. Tagged death, IndyCar, Justin Wilson. « Wat is er nodig om van Noord een prima fietsgebied te maken?